If you missed Rei Kawakubo's "Art of the In-Between" exhibit at The Met (closed September 4, 2017), I hope my photos below will inspire you to look up her work (see links at the end of this post). I've never seen anyone blur the lines between fashion and art as effectively as Kawakubo. When I see her work I think "body sculpture." 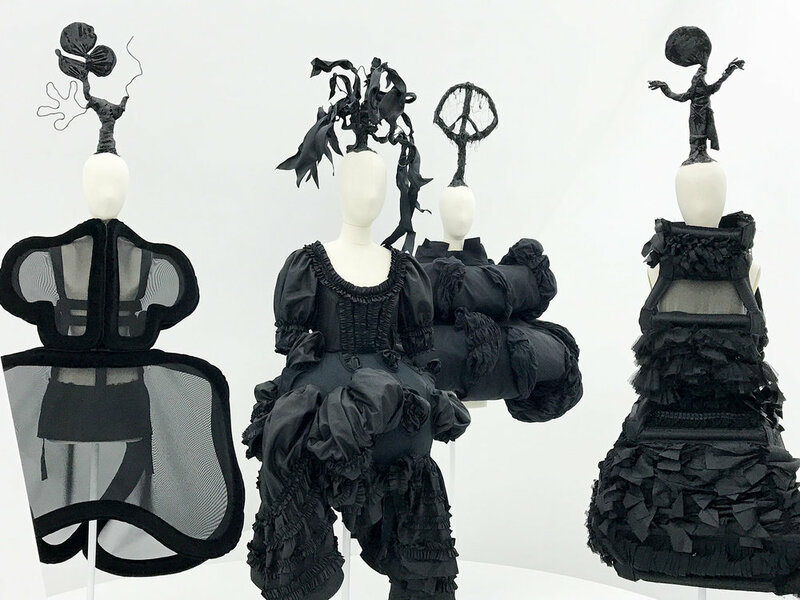 While I've always been captivated by the silhouettes and other sculptural or design details of haute couture, Kawakubo's philosophy and work are in an entirely different stratosphere. She's a phenomenally innovative designer who is never satisfied. Her eternal quest for "newness" yields ingenious designs. "...she upends conventional notions of beauty and disrupts accepted characteristics of the fashionable body." I stole that line from the exhibition brochure. 'nuff said. She has mastered visual ambiguity in the space she calls "in-between". Her imaginative mashups invigorate me. I want to be like Kawakubo when I grow up. She has successfully transported me away from the tragic reality of the screwed-up politics of our nation for a short period of time. Thank you, Rei Kawakubo, for providing relief and inspiration. 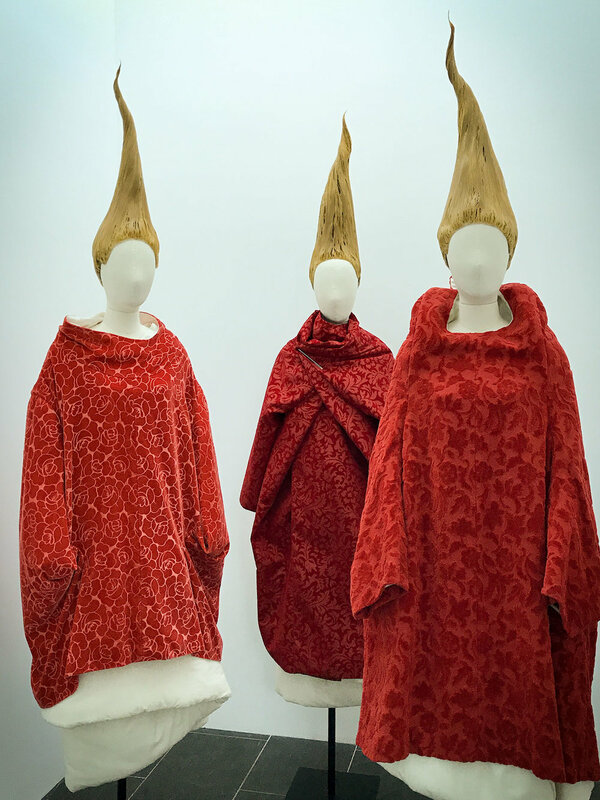 Nine expressions of the "in-betweenness" in Kawakubo's collections were on display: Absence/Presence, Design/Not Design, Fashion/Antifashion, Model/Multiple, High/Low, Then/Now, Self/Other, Object/Subject and Clothes/Not Clothes. The collections were presented in a white set-like environment designed to create a perfectly integrated experience for the viewer. Enjoy this random selection of images and scroll to the end for a link to a wonderful video of gallery views, narrated by curator Andrew Bolton. For more information and inspiration, check out the video introduction on The Met's site (scroll down to Featured Media). And here's a link to the Comme des Garçons ("like some boys") website. Enjoy!